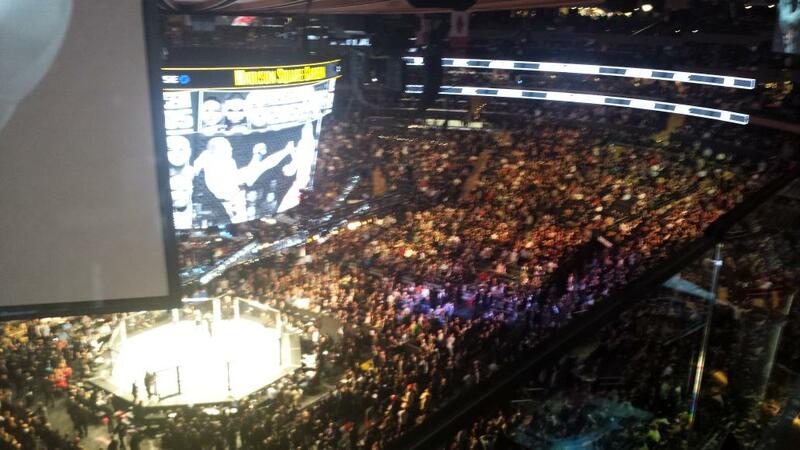 On November 2, 2013, Dagestani boxer Magomed Abdulsalamov fought before a cheering crowd at Madison Square Garden. He fought his heart out, fought to the final bell, fought until his brain was bleeding. But the New York State Athletic Commission – tasked to protect him and every other professional pugilist who laces up the gloves in the state – ignored his plight. Then came the coma and the stroke, the $100 million lawsuit and the investigation by the Inspector General. Ask my eight-year-old daughter about the “Butterfly Effect” and she’ll spin a yarn about time travel, and how one event can send out ripples that irrevocably change the future. 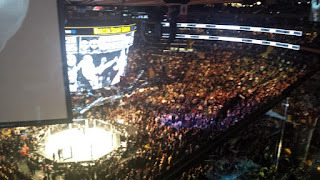 On Saturday, November 12, 2016, the UFC came to Madison Square Garden for the first time, came to New York for the first time since the 1997 ban on pro mixed martial arts. They had to pay over $40,000 to insure the fighters, an amount heretofore unheard of in combat sports, and they had to work with an athletic commission that had never before sanctioned fights in an octagon-shaped cage. Abdulsalamov never saw that butterfly land on him on that night three years ago. But it did. And New York would never be the same. While Abdulsalamov slept his slumber of blood clots and loss of motor skills, the boxing world could not have foreseen the calamity it would bring to it, or maybe it could. Maybe the writing was on the wall with how much progress the UFC was making each successive year in getting the ban lifted. Maybe they could sense something brewing with the subpoenas, depositions and state investigators dropping by to ask questions, and is it true New York State Athletic Commission Chairwoman Melvina Latham accepted a gift of jewelry from a promoter? Was a Commission inspector really more concerned with collecting fighters’ wraps to sell on e-Bay than with the boxer who was fainting over and over again in the locker room with blood trickling out of his ears? It’s possible that the boxing world – the collective promoters, managers, trainers et al. – could see the change that was coming. But whether they did or didn’t is irrelevant. In March of this year Abdulsalamov was no longer sleeping but he was forever a changed man, and the bill finally passed that would legalize mixed martial arts. Contained within was the crushing straight left of a million-dollar brain injury insurance requirement that would in theory help future Abdulsalamovs, or at least protect the State from its own negligence. It would also make promoting fights prohibitively expensive for all but the deepest of pockets. The shakeups at the Athletic Commission came next, the firings and resignations and reassignments, and suddenly there loomed the big question: When the UFC comes to town for their massive show at MSG, would the Commission be up to the task of making sure the fighters were safe? The New York Department of State (DOS) runs the Commission, and with Governor Andrew Cuomo’s MMA Bill-signing photo op at MSG in April and promises of hiring experts to get the job done, there was hope that the DOS would make things work. But the firing of Commission Executive Director David Berlin led to a New York Times story on the unreleased Inspector General’s report, and suddenly more heads rolled, with Chairman Tom Hoover exiting in disgrace and an overseeing DOS Deputy Secretary switched out for someone with more clout. An MMA Coordinator was hired – Kim Sumbler, formerly of the Seneca Nation of Indians Athletic Commission – and rules and regulations were codified. Meanwhile, all pro boxing ceased to exist, the promoters singing in unison about how the insurance requirements had killed them. Take a step back and squint your eyes, and it almost looked as if the New York State had purposely traded in its ten-ounce gloves for the ones that weighed less than half that, the kind of fingerless gloves that allow for both knockouts and rear naked chokes. “Why won’t the New York commission let him fight but another commission will?” is the common refrain, followed by, “Is the medical issue really that bad?” And yet no one can hear the flutter of those butterfly wings from three years ago, and see how, because of Abdulsalamov, this Commission’s willingness to take any kind of risk lies somewhere between zero and “no freakin’ way”. Of course an irregular MRI means Evans is off the card. Of course. It’s likely that there were even discussions within the Commission to consider bad omens and superstitions as disqualifiers. When Friday comes, so too comes the weigh-ins, which take place in an official capacity early in the day (the ceremonial ones will take place in MSG’s arena before a crowd of over 15,000 later on). It’s at the early weigh-ins that we learn of the Athletic Commission’s requirements that fighters be within certain pound limits of each other. On a card where everyone makes weight, this would never be an issue, but the Fates have something else in store for UFC 205. Fighting at welterweight like he’s been doing lately, Donald Cerrone makes weight and the result is recorded. His opponent, Kelvin Gastelum, has had a bad cut and won’t be anywhere near there, and doesn’t even bother to step on the scale. The word is he’s around 178 pounds. In another jurisdiction, it’s possible that “Cowboy” could have agreed to accept the fight despite the disparity. Not here, though. No difference greater than five pounds is the word handed down from the Commission, words uttered aloud too late. Because if Cerrone had known of that maximum differential, a UFC handler could’ve told him to hurriedly scarf down a cheeseburger or two in the back, with the goal to get him up to 173 pounds before his weight was made official. A similar situation plays out with Thiago Alves and Jim Miller, with the Brazilian too heavy for lightweight. But by this time everyone is aware of the new rule, and Miller is told to stop cutting weight and put some back on. He does, and Alves versus Miller is saved. Back at UFC 34 in Las Vegas, it was possible for a credentialed journalist to go backstage and visit the locker rooms, to poke his nose in the grinding gears of the machine as it hummed, and look on as doctors stitched fighters up or, in the worse cases, as doctors helped strap the fighters to gurneys so the ambulance could take them away. But that access disappeared years ago. Nowadays, to divine what goes on beyond the press room and the assigned seats, one must analyze the evidence of things unseen. For UFC 205, the evidence comes in the Commission’s choice of referees. Instead of connected know-nothings who got their assignment because they were tight with the Commission Chairman, veteran officials John McCarthy, Dan Miragliotta and Keith Peterson rule the cage (when Frankie Edgar accidentally takes a finger to the eye, Peterson pauses the bout and has a doctor check him, despite Edgar’s insistence that he’s fine). The evidence comes when Dr. Sherry Wulkan appears in the Octagon, Wulkan so experienced and skilled that she runs the show for the New Jersey State Athletic Control Board as its medical chief. The evidence comes in the choice of judges, in the number of fighters sent to the hospital for more extensive post-fight care and in the suspensions handed down to the injured, like Chris Weidman, who took a knee to the eye and wore his grotesque wound like a half a Halloween mask at the press conference afterwards. Ultimately, the evidence comes in the complete and utter lack of athletes succumbing to brain bleeds, falling prey to comas and strokes and ruining combat sports in New York forevermore. A pessimist might say that the Commission had help in the form of UFC executive Marc Ratner, who ran the Nevada State Athletic Commission in a past life, and who remains the backbone of the UFC’s sanctioning apparatus for when they run shows in jurisdictions that lack sanctioning bodies of their own. A pessimist might say that the New York State Athletic Commission leaned heavily on the wisdom of Mohegan Tribe commission director Mike Mazzulli, and that of course the New York Commission sought help, otherwise they would’ve all been fired. But not even the dangling Sword of Damocles ensures decisions that lead to the best outcomes, and for a commission that very nearly let a boxer die three years ago because of the grossest of negligence, an event that ends with its fighters unharmed (relatively speaking) can only be considered a success. It doesn’t matter that the New York Commission got help – it matters that they asked for and accepted it. After the legions of Irish had finished their celebratory rampage through the streets of Manhattan, and the Octagon was disassembled and stowed for travel to its next destination, I asked around about how the Commission had done. “Marvelously” was the consensus between two different high-ranking sources (who shall remain anonymous). What happened to Abdulsalamov can only be described as tragic, and it’s very likely that the Powers That Be in New York would be happy to never see another boxing card in the state now that they’ve tested the splendor and tax revenue that is a Conor McGregor-headlined UFC event at Madison Square Garden. But what truly matters is that UFC 205 went down in the history books for all the right reasons, reasons that have nothing to do with institutional incompetence and corruption. There were no butterflies on Saturday night. And when it comes to New York and the sanctioning of mixed martial arts – and the inaugural performance of a commission determined not to repeat the mistakes that mar its past – there are perhaps none in our future. After almost 20 years of nothing, you can't ask for more.